Application isolation is the separation of one program or application stack from the rest of the running processes. The oldest way to do this is to simply run your application on a separate computer, but that gets very expensive very quickly. There are two main ways to tackle Application Isolation on one computer: Virtual Machines and Containers. They both achieve similar end results but achieve that end in different ways and offer different advantages / disadvantages. 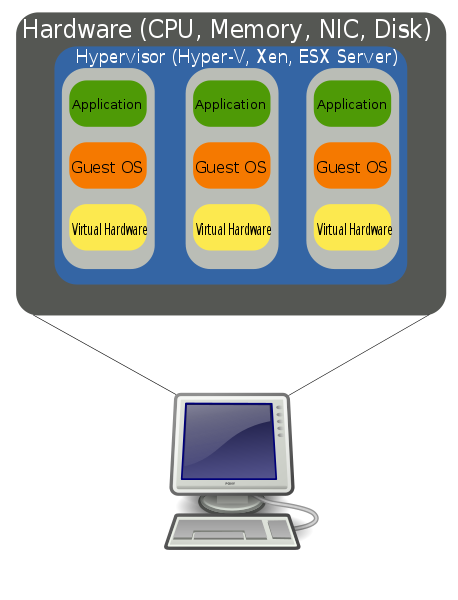 Virtual Machines are programs that act like (or emulate) another computer (Also called a “guest”) that’s running on your physical computer (The “host”). This is useful because a VM completely isolates programs running from the host computer. Let’s talk about that emulation problem. Imagine you are running a computer that has an X86_64 CPU on it. You want to emulate a computer with an ARM5 CPU. The emulated operating system makes system calls to the ‘hardware’ it thinks it is running on. The host operating system translates those system calls into real system calls on the actual hardware. This translation is cost intensive and usually slow, but it’s gotten a lot better over the decades. When emulating a separate CPU architecture, optimizations usually have to be made for the emulated OS to be usable. Note: When you are emulating an X86_64 VM on an X86_64 piece of hardware, an optimization that can be made in which the host OS passes the system calls directly to the hardware without having to translate anything. This is done by a hypervisor which enforces certain security protocols so the two operating systems (host and guest) are still isolated, but things go much faster. 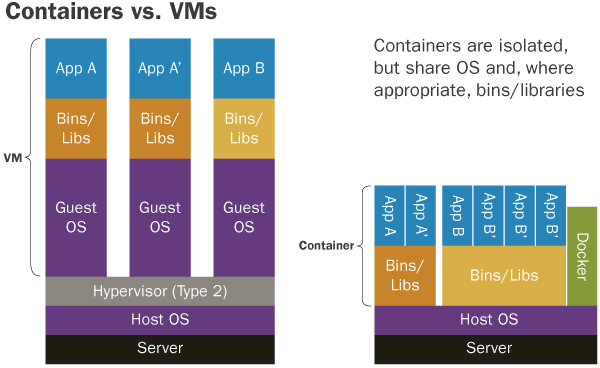 Containers approach application isolation from a different angle. Instead of emulating the guest OS, containers use the same kernel as the host but lie to the guest process and tell it that it’s the only application running on that OS. Containers bypass the emulation problem by avoiding emulation altogether. They run on the same hardware as the host OS but with a thin layer of separation. Containers have very become popular recently, but their underlying technologies aren’t new. Many application developers and system administrators have begun migrating toward using Containers over VMs as they tend to be more performant, but the industry as a whole is waiting for them to get a bit more battle-tested. As you can see, instead of emulating an entire OS (running 100+ processes), the container is told that it’s processes (sh and ps in this case) are the only one in this environment. In theory this prevents a malicious attack from inside the container from invading the host OS. Containers are made possible by many underlying technologies that coexist both inside and outside of the Linux kernel. A program that allows you to only make part of a filesystem visible to another process by changing the root directory. Literally ” ch ange root ”. A Linux kernel-level technology that name-spaces processes. It performs many functions, but it’s used by container engines to convince a process that it’s running in its own environment. This is what isolates a process from other processes, if they think they’re the only thing running they can’t tamper with the host OS. The service manager for most Linux distributions. Systemd can be used to run and manage services such as web servers, but it can also limit an application’s resource usage. This allows you to limit a container from using all of your computer’s resources. In addition, many popular container management systems such as Docker run as services managed by Systemd. Slightly more overhead. Security concerns. Slow startup. No cross-kernel emulation. Many of these concerns are temporary or negligible. For instance, many organizations that run virtual machines aren’t concerned with startup times. And security concerns are a temporary issue in that the industry is already developing solutions for the existing security problems with containers. One of the major downsides to containers is that by definition they’re restricted to using the host machine’s kernel. This means that a Linux host cannot run a Windows container and vice-versa. The industry solution to this problem is to run a container in a small VM, since virtual machines can run any type of kernel on any host system. There are a multitude of tools for using and managing VMs and Containers. There are a lot of tools for managing Virtual Machines in many different ways. An Open Source VM Manager. Widely used and supported on Linux, Mac, and Windows. A closed source VM Manager. VMWare is a widely used and tends to have better performance than Virtual Box. While it can emulate Linux it does not work natively on Linux. Linux’s native infrastructure for handling Virtual Machines and emulation. Usually used in a larger emulation program, not alone. Containers have only recently gained popularity, but there are already many tools available for container management. The de facto CLI tool for creating and using containers. Very popular and well integrated into other tools. A competitor to Docker created by CoreOS. Approaches container management from a different angle which has it’s advantages and disadvantages. The oldschool way to use containers. Not a container in the modern sense, but achieves similar process isolation. The BSD Unix form of containerization. Offers a level of secure isolation not really possible in Linux.